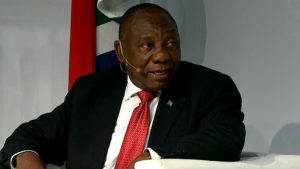 Ramaphosa urges African leaders to drive more investors into Africa - SABC News - Breaking news, special reports, world, business, sport coverage of all South African current events. Africa's news leader. President Cyril Ramaphosa says Africa is a continent full of opportunities which need to be unlocked. President Cyril Ramaphosa has encouraged African leaders to create an enabling environment to drive more investors into Africa. Ramaphosa was delivering the keynote address at the Africa Investment Forum in Sandton in Johannesburg. The forum aims to boost trade between African countries, as well as drive investment for the continent. This is as the continent seeks to find solutions to achieve the AU’s 2063 goals for growth and sustainable development. Ramaphosa says Africa is a continent full of opportunities which needs to be unlocked. “Indeed this is a market place to do deals, and conclude transactions. Africa is indeed a continent on the move; it is indeed a continent on the rise. It has experienced significant growth over the last two decades and this has largely been fuelled in part by improved governance and deepening democracy through a number of countries on our continent. Rising income has seen the growth of the middle class and an increase in consumer spending has fallen in tow,” explains the President. This entry was posted on 08 Nov 2018,11:29AM at 11:29 AM and is filed under Business. You can follow any responses to this entry through the RSS 2.0 feed. Both comments and pings are currently closed.